The terminator is shown in red. It marks the boundary between light and darkness, and is always a circle. Perhaps the earliest biblical confirmation of a spherical Earth is implied in Genesis 6-8. Here we read about a worldwide flood in which all the high hills under the entire sky were covered with water (Genesis 7:19). This would be impossible on a flat earth; the water would either run off the edge, or the edges would be raised so as to trap the water, in which case the edge itself would not be flooded and would constitute a hill that was not under water. A global flood is only possible on a globe. Interestingly, all these passages were written at a time when the secular scholars of the day believed that the Earth was flat. Isaiah was written around 700 B.C. Job was written around 2000 B.C. Moses wrote Genesis around 1500 B.C. However, there is internal evidence that Moses used historical documents that were previously written by eyewitnesses as source material under divine guidance (e.g. Genesis 5:1, 6:9, 11:10). In any case, the Bible’s references to a spherical Earth predate the oldest secular reference. Generally, the Greek mathematician Pythagoras is credited with being the first secular scholar to propose that the Earth is round. His argument for this (if he had one) is not recorded. But Pythagoras lived around 500 B.C., long after the biblical references to a round Earth had been written. Aristotle is generally credited with being the first secularist to demonstrate that the Earth is round from such lines of evidence as lunar eclipses. The Earth’s shadow on the moon is always circular regardless of the orientation of the sun and moon relative to Earth – this is only possible for a spherical planet. Aristotle lived during the 300s B.C. So we see that the Bible recorded a round Earth long before the secular scholars of the day. It is almost as if the Hebrews had some divine insight into the issue. How about that! It follows that there was a time when the secular scholars of the day would have claimed that the Bible is wrong in its assertion that the Earth is round. But today, the Bible has been vindicated. In a time when the secular experts believed the Earth to be flat and floating in water, the Bible teaches that God “hangs the Earth on nothing” (Job 26:7). This verse poetically describes the fact that Earth floats in space and is suspended on nothing. This cosmic fact is remarkably counterintuitive and may have been hard to believe when it was recorded. After all, everyday experience informs our senses that things fall unless they are suspended on something. The ancient idea that Earth is flat and floats in water is far more intuitive; we have seen that some things do float in water. But to suspend to the Earth on nothing may have seemed ridiculous. But today, the Bible has been vindicated. The Earth indeed hangs on nothing, and we now have pictures that confirm this. Mass is an object’s resistance to a change in velocity; objects with greater mass are “heavier” and harder to push. Energy is the ability of an object or system to do work: to make something change its state of motion. Energy can be in the form of motion itself (kinetic energy) or it can be stored (potential energy). Einstein discovered that mass and energy are equivalent; they are basically the same thing but measured in different ways with different units. Basically, the more physical stuff you have, the more mass/energy you have. Mass can be transported from one place to another. But we can neither create nor destroy mass. We cannot increase it or decrease it. We can only move it. This is the principle of the conservation of mass. Likewise, we cannot create or destroy energy. We can move it from one place to another, or transform it from one kind of energy to another. But the amount of energy remains constant. This is the principle of conservation of energy. James Joule (1818-1889) is considered the discoverer of the conservation of energy. However, the Bible anticipated his discovery by thousands of years. From Scripture, we expect that no new material (mass or energy) will simply pop into existence, because God alone is the Creator. All things were made by Him (John 1:3; Colossians 1:16), and God finished His work of creation by the seventh day (Genesis 2:2). Since God is done creating, and since only He can create, we expect no new material will simply appear. Furthermore, we expect that material will not simply vanish, because God upholds what He has created and holds it together (Hebrews 1:3, Colossians 1:17). These two facts together form the conservation laws of mass and energy. These principles were implicitly in Scripture nearly two thousand years before they were discovered by scientific means. In a number of places, the Bible teaches that God has stretched out the heavens (e.g. Isaiah 40:22, 42:5, 44:24, 51:13, Job 9:8, 37:18, Psalm 104:2, Jeremiah 10:12, Zechariah 12:1). The Hebrew word translated “heavens” is shamayim and has the basic meaning of “sky” – referring to anything above and beyond the surface of Earth. It often refers to outer space, the realm of the stars (e.g. Genesis 1:14-17). Apparently, God has stretched out the universe such that it is a bit bigger now than when it was first created. The earliest references to this stretching occur in the book of Job (9:8, 37:18) which was written around 2000 B.C. This is significant because the stretching of the heavens was not discovered by scientific means until the 1920s. The Bible had this information nearly 4000 years earlier. In the 1920s astronomer Edwin Hubble systematically measured the redshifts of galaxies – the stretching of the wavelengths of light. Such redshifts indicate that the distance to the galaxy is constantly increasing; the galaxy is moving away from us. Hubble found that virtually all galaxies were redshifted; that nearly all of them were moving away from us. Further, he measured the distance to these galaxies, and found that there their distance was proportional to their recessional velocity; the farther away a galaxy is, the more redshifted its light and therefore the faster it is moving away from us. This implies that virtually all galaxies are moving away from each other. The only way this can occur is if the entire universe is being stretched out. From Hubble’s observations, the universe is apparently expanding; it is slightly larger today than it was yesterday. These observations are a spectacular confirmation of Scripture. This discovery is particularly significant because the standard secular view throughout history was that the universe was eternal and static. The ancient Greeks believed that cosmic cycles were eternal, and that stars were fixed with respect to each other. This view permeated secular thinking for millennia. Even by the 1920s, a static universe was the standard view, and many scientists (including Albert Einstein) were reluctant to accept Hubble’s discovery. However, today virtually all astronomers accept that the universe is expanding, just as the Bible has apparently taught all along. This is also significant because there seems to be no way that ancient humans could have known about such expansion by scientific means. Hubble’s discovery required the use of a very powerful telescope and a spectroscope – both modern inventions. Without such technology, the ancient Hebrews still knew about the expansion of space. Of course, this is consistent with the biblical view that the Bible was written by inspiration from God Himself. Does such expansion imply a big bang? After all, if the universe is expanding, then it must have been smaller in the past. Some people then ask, “Why not extrapolate all the way back to a point of no size?” The answer is “There is no reason to think that the universe started as a point of no size.” Just because something is larger today than it was yesterday does not imply that it was once infinitely small. 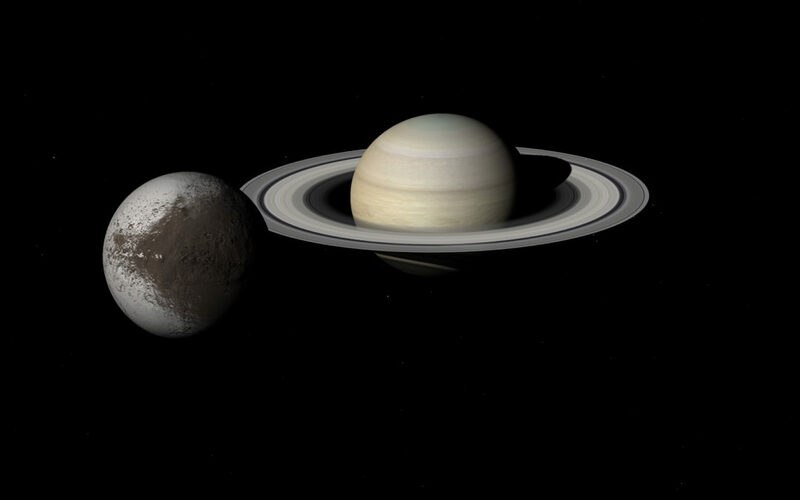 The universe was created with Earth already in it (Genesis 1:1), and therefore had some size to begin with. It is simply bigger now. Another misconception is that expansion of the universe was a prediction of the “big bang” idea. But it isn’t because the expansion was discovered first. The “big bang” was invented in 1931 as a naturalistic explanation for such expansion. But there is no rational reason to assume that the universe once had no size, or that it popped into existence from nothing merely from the observation that it is expanding. A tall tree may grow from a very small seed, but the seed still has some size and did not pop into existence from nothing. The Bible often uses the “stars of heaven” in a simile to represent a humanly uncountable number. Abraham’s descendants are said to be as uncountable as the stars of heaven (Genesis 15:5, 22:17, 26:4, Exodus 32:13). The analogy is delightful. However, it may have seemed inadequate to the critics when the statement was first made. The number of stars visible to the unaided eye is estimated to be somewhere between 3,000 and 10,000. These are large numbers, but countable. Is the Bible mistaken? In 1608, a Hans Lippershey patented a new device that used lenses to make distant objects appear much closer: a telescope. By 1610, Galileo Galilei had created his own version of the telescope and began exploring the heavens. To his surprise and delight, he found that the telescope revealed far more stars than are visible to the unaided eye. Normally, seven stars are visible in the Pleaides; but Galileo could see dozens more with his new instrument. The stars of Orion were similarly multiplied. Perhaps most spectacular of all, a small telescope reveals the Milky Way – that cloudy belt spanning the summer night sky – to be composed of billions of stars. Today, astronomers estimate that there are at least 100 billion stars in the Milky Way galaxy, and at least 100 billion galaxies in the visible universe, and perhaps many more. These are estimates only. Clearly, in a human lifetime, no one could count the number of stars in just our galaxy, to say nothing of all the other galaxies. The Bible is again vindicated. 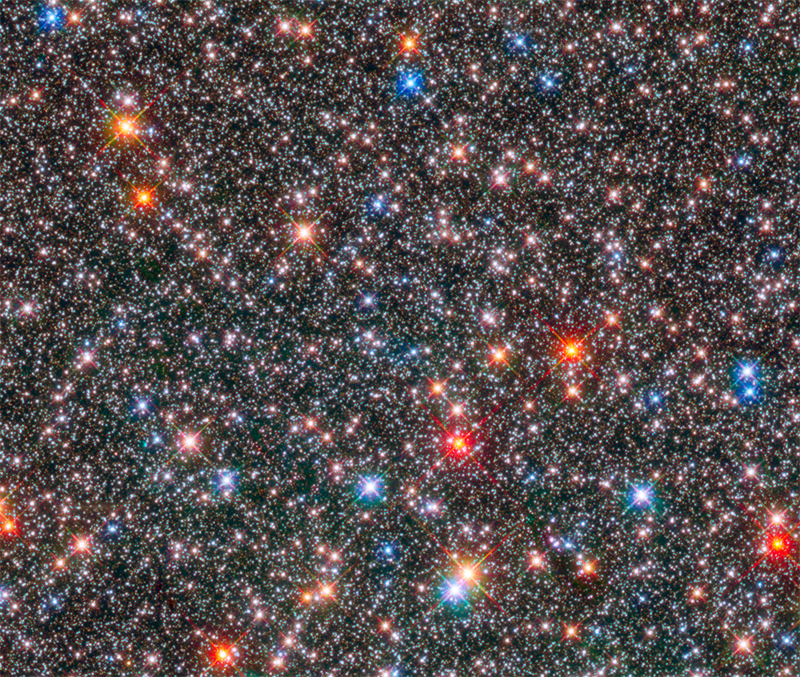 Hubble Space Telescope image of a rich star field near the galactic core. When the Bible touches on astronomy, it is exactly right. It always has been. As God’s Word, it could be no other way. In the above examples, the Bible was making accurate claims with which the secularists of the time disagreed. The Bible taught a round earth while the secularists still believed in a flat earth. The Bible taught an expanding universe while the secularists believed it to be static. Do you suppose ancient critics argued against the authority of the Bible on the basis of their scientific models? Did anyone ever say, “The Bible can’t be right because it teaches a round Earth, whereas our best scientists have shown that it is flat?” Did anyone ever argue, “The Bible is ridiculous in claiming that stars are humanly uncountable; Ptolemy has exhaustively catalogued only 1022 stars?” If so, they were wrong then, and they are wrong now. “Ah, but their science was very primitive,” argues the critic. “Today, we have modern science. And so we know that Bible is wrong about the age of the universe and the order of origins.” Those who argue this way have not learned the lesson of history. All science is “modern” at the time. And in a thousand years, the science of today will look as primitive as we view the science from a thousand years ago. But the Bible will still be God’s Word. And it will still be right. Granted, God can do a creative miracle if He so desires. But miracles are by definition rare, and for a specific purpose. Therefore, we expect the conservation laws to be God’s normal modus operandi. On Matter, Vital Force and Heat. By J. P. Joule, A Lecture at St. Ann’s Church Reading Room 1847. Cited from E.C. Watson’s paper Joule’s Only General Exposition of the Principle of Conservation of Energy.